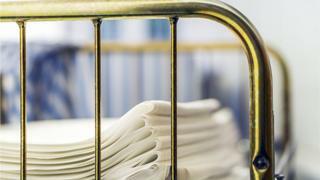 Aging laundry services are posing a "significant risk" to infection control across north Wales' hospitals, a report warns. About five million items are laundered by the linen factory at Glan Clwyd Hospital in Denbighshire every year. The Betsi Cadwaladr University Health Board has been told machines have experienced "major breakdowns" and there are "pest control" issues. The board will discuss opening a new facility at a meeting on Thursday. The report, prepared by Rod Taylor, director of estates and facilities, recommends putting forward proposals to the Welsh Government in the hope of securing funding for a new off-site facility, at the cost of £27.9m over 15 years. The facility has seen little large scale investment since Glan Clwyd opened in 1981 with the machines now "obsolete". The system of pipes under the building also means the factory needs regular monitoring for pest control. The report warns that doing nothing is not an option as it "represents a significant risk to business continuity and safety" as it is unable to comply with decontamination standards. Mr Taylor said: "Equipment age and condition are now a significant risk to the service due to lost production, service breakdowns and mechanical failures. "This poses a significant risk to the Health Board, in regard to reducing healthcare-associated infections." If the board decides to go with the preferred option at the meeting in Llandudno, it is hoped the new factory could be opened by May 2019. A report earlier this year highlighted major improvements were needed at north Wales' three main hospitals to reduce the risk of infection, after targets for 2016-17 were missed. This was despite a 25% drop in Clostridium difficile (C. diff) cases and a 9% fall in MRSA cases. Last November, a major outbreak of the winter vomiting bug - norovirus - hit Wrexham Maelor Hospital and two community hospitals run by Betsi Cadwaladr health board. The outbreak closed nine hospital wards in north Wales alone. In a statement, BCUHB said modern and efficient laundry services were essential for supporting clinical services and reducing hospital infections and the board faced "significant challenges".